One of my favorite aspects of ranch life is the horses. Not only are they beautiful, curious and intelligent animals, they are generally friendly and like to be around people. 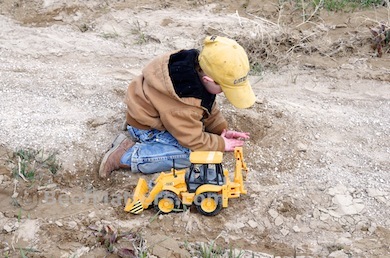 They were certainly curious yesterday as my little boy and I walked down the road toting our toy backhoe and tractors. We had just returned home from spending the morning with my husband getting a few ranch jobs done. It was time for me to tackle a few chores around the house, but my son had a different idea. Throwing his arms around me he said, “You’re my best Mom ever. Want to play in the dirt with me?” Hard to resist a line like that. Grabbing our heavy equipment we set off for a sandy spot down the road. As we walked past the horse pasture, the horses were standing against the fence waiting for us. I scratched a few noses and patted a few necks. 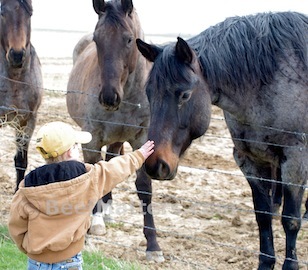 I had to smile when I saw my son’s little hand stretched out toward the horses, wanting to pat the horses, too. It wasn’t long before Blue leaned over the fence to greet my son. They spent a couple of minutes sniffing and patting each other. 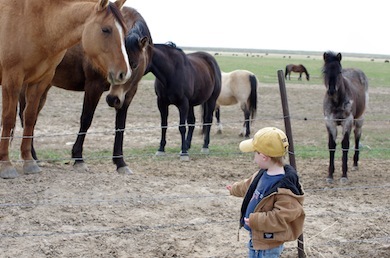 Then we turned to the sand pile and got to work, while my son’s new friend, Blue, watched from their side of the fence.